“Single roll” toilet paper dispensers are the work of the devil. At home it’s not so much of a problem because you can always just go and get another roll (or yell for your wife to bring it :P) but I’m talking about commercial or public toilets with those massive rolls. 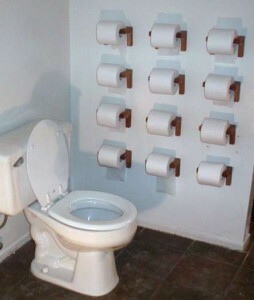 At the church where I used to volunteer, we always had to throw out “nearly finished” rolls – imagine you found yourself in a public loo running out of toilet paper because some stingy accountant was trying to save money by ordering the cleaners not to change the roll until every last sheet was used. Being a public venue and having dispensers of the type which locked, we couldn’t put a spare roll for people to replace themselves. Not that somebody would try and slip a giant 2Kg toilet roll down their pants to take home; maybe it was more to prevent kids from rolling them down the stairs. Would it have been cheap to hoard the leftovers and take them home? when designing and building the toilets it may have been cheaper to buy the single-roll dispenser, but this choice ultimately led to more waste, and hence both financial and environmental cost, than if a little extra had been spent on the double-dispenser. This is but one of the everyday inefficiencies that I want to combat through this blog. Are there examples of inefficiencies in your world? I’m always open to ideas for topics that I can help bring to peoples’ attention, so leave a comment below!